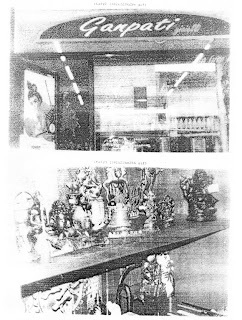 Indian temple sculpture of gods and goddesses, antiques, pichwai paintings, shatoosh shawls, coins, and you name it, were transported to Italy to be first displayed in two shops owned by her sister, Anuskha alias Alessandra Maino Vinci. 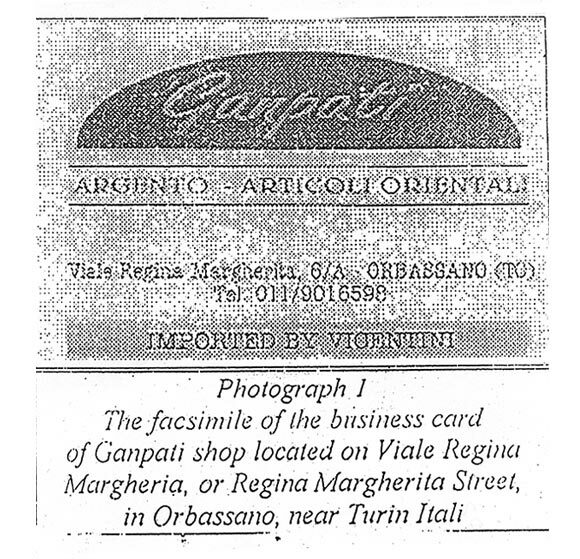 These shops located in blue-collar areas of Rivolta [shop name: Etnica] and Orbassano [shop name: Ganpati] did little business because which blue collar Italian wants to buy Indian antiques ? 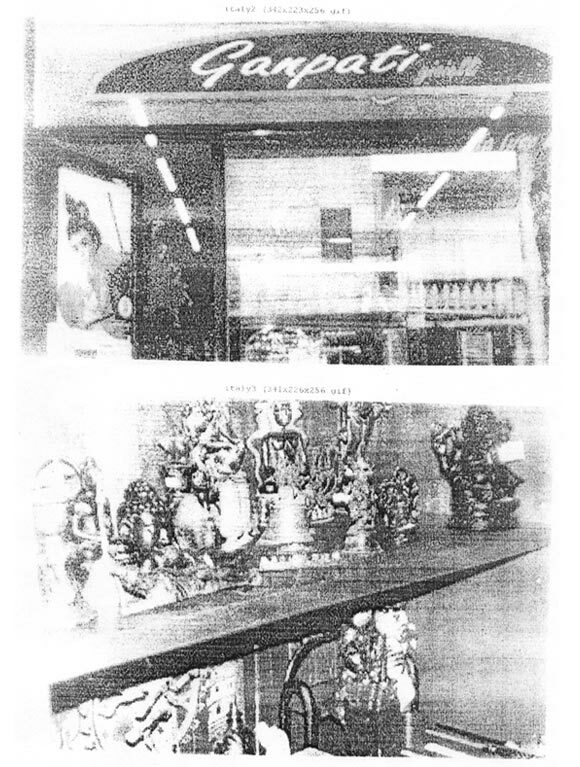 The shops were there to make false bills, and thereafter these treasures were taken to London for auction by Sotheby’s and Christies. 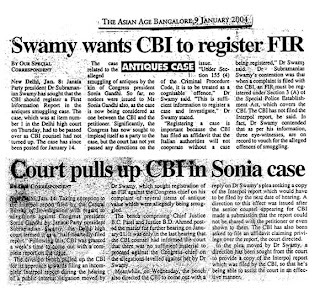 Below An article in Hindu dt.3.2.98 regarding Antique shop run by Sonia Gandhi’s family in Orbassano and Proceeings in the Delhi High Court regarding the Antique smuggling case by Dr.Subramanian Swamy. 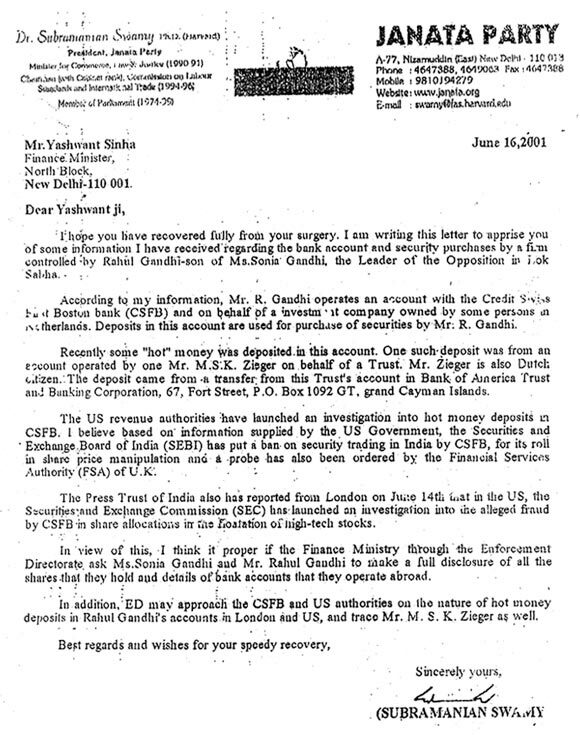 Some of this ill-gotten money from auction went into the bank accounts of Rahul Gandhi in the National Westminister Bank and Hongkong & Shanghai Bank, London branches, but most of it found it’s way into the Gandhi family account in the Bank of America in Cayman Islands. 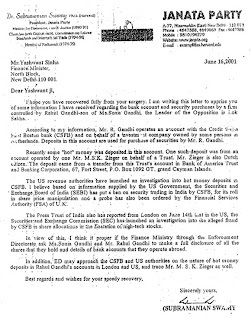 Rahul’s expenses and tuition fees for the one year he was at Harvard, was paid from that Cayman Island account. 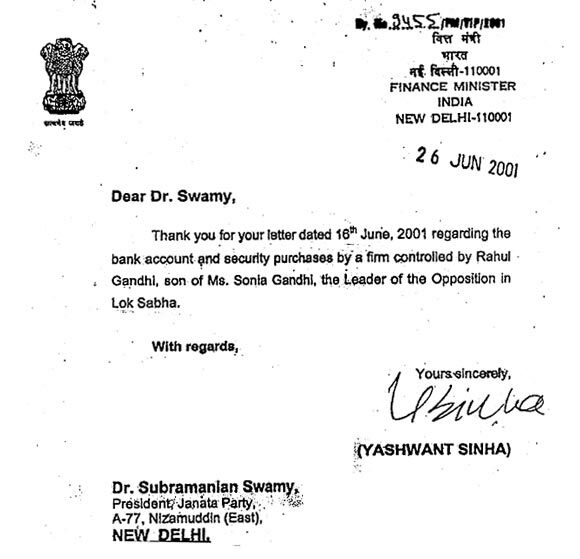 Below Dr.Subramanian Swamy’s letter to the then Union Finance Minister Mr.Yeshwant Sinha regarding Rahul Gandhi’s foreign bank a/c and the acknowledgement of the letter by the Minister. 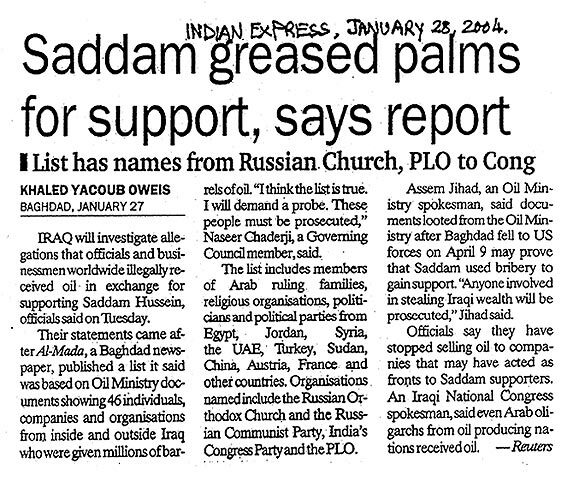 The Maino family have had extensive business dealings with Saddam Hussein, and surprisingly since 1984 with the LTTE [“the Tamil Tigers”]. 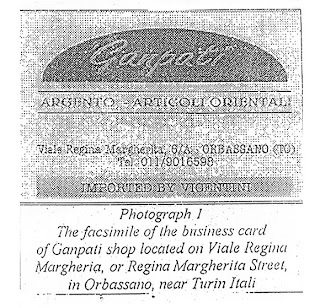 Sonia’s mother Paola Predebon Maino, and businessman Ottavio Quattrocchi are the main contacts with the Tigers. 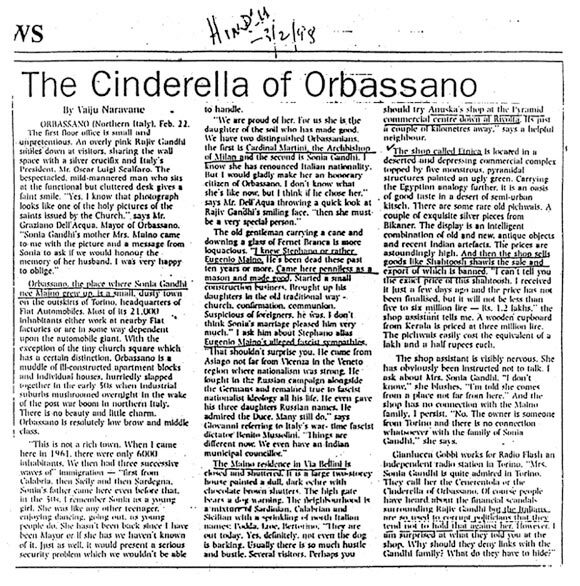 The mother used the LTTE for money laundering and Quattrocchi for selling weapons to earn commissions. Sonia’s conduit to the LTTE has been and is through Arjun Singh who uses Bangalore as the nodal point for contact. 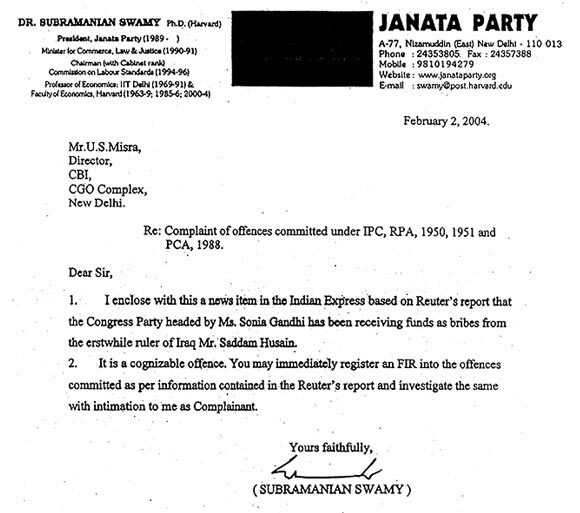 Below Dr.Subramanian Swamy’s letter to Director, CBI enclosing a news item in Indian Express regarding receipt of funds by Congress Party from Saddam Hussain. 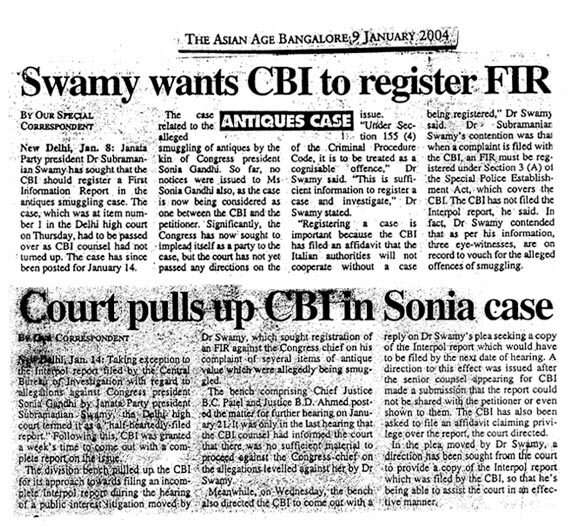 Sonia is quite unabashed in having political alliance with those who like MDMK, PMK, and DMK praise Rajiv Gandhi’s killers. 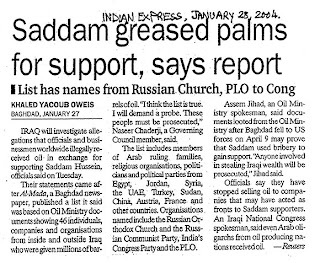 No Indian widow would ever do that. Such circumstances are many, and raise a doubt. 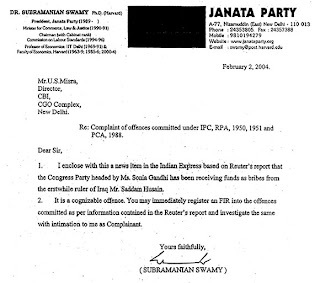 My investigations into Sonia’s involvement in Rajiv’s assassination is therefore necessary. Is it not a fact that Indira Gandhi died because of loss of blood from the wounds and not directly due to a bullet impacting her head or heart ? 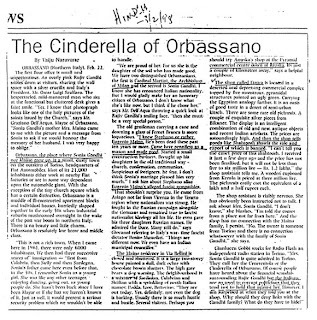 Then is it not strange that Sonia had insisted that the bleeding Indira be driven to Lohia Hospital-- in the opposite direction to AIIMS which had a contingency protocol set up for precisely such an event ? And after reaching Lohia Hospital, did not Sonia change her mind and demand that they all drive to AIIMS thus losing 24 valuable minutes ?